Onion slices double-dipped in a premium draft beer batter and served with ranch dressing. Four strips of tender, juicy breaded fried chicken strips, served with ranch dressing. This favorite “South of the Border” appetizer starts with a flour tortilla; then stuff it with cheddar and Monterey Jack cheese, grill it and serve it with salsa. Add onions, green peppers or mushrooms – just $0.50 each! Our hand crafted dough, generously brushed with garlic butter & loaded with mozzarella and parmesan cheese. 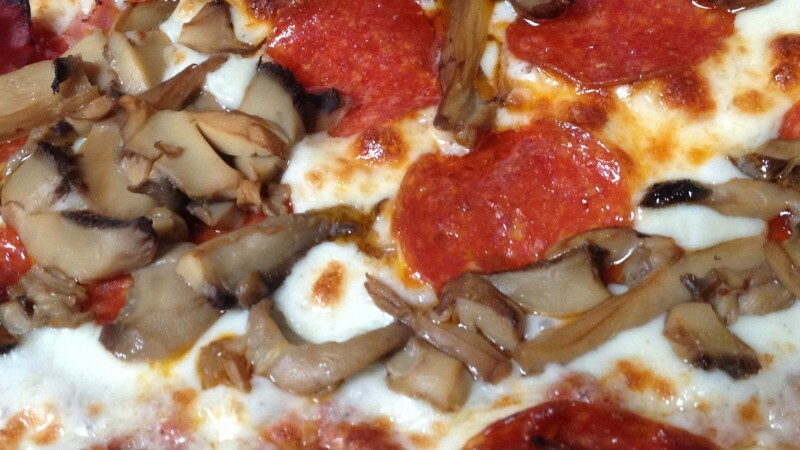 Oven baked and served with marinara or garlic cheese dip. A combination of onion rings, boneless wings and breaded cheese curds, served with ranch dressing. 8 jumbo wings, dipped in your favorite sauce, baked and served with bleu cheese dressing. Our homemade dough, made daily & baked fresh to order, buttered and sprinkled with garlic parmesan blend. Served with marinara sauce or garlic cheese dip. Lightly breaded white cheddar cheese with a buttery finish and served with our own homemade ranch dressing. Golden tater tots, white cheddar cheese curds, smothered with brown gravy. Tater tots covered with seasoned ground beef, cheddar cheese, jalapeños, onions, tomato, sour cream, scallions, served with salsa. 1/2 pound of boneless chicken wings dipped in your favorite sauce. Fresh romaine lettuce with Caesar dressing and parmesan cheese, then topped with red onions and homemade croutons. Choice of Mesquite Chicken or Pulled Pork. Homemade chicken salad with walnuts and raisins, cottage cheese and tomato sliced, served with homemade breadstick. All burgers grilled to order and served with chips. Fresh Ground from U.S.D.A…. Black Angus beef. Make any 1/3 lb. burger a 2/3 pound burger for 1.99. “Combo It” for only $2.99! Includes French fries and your choice of coleslaw or homemade soup. 1/3 pound char-grilled Black Angus beef on a grilled artisan bun. Served with lettuce, tomato, and pickle. 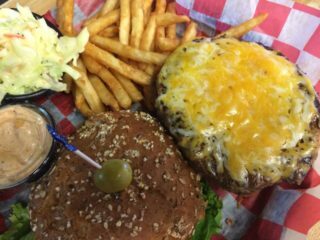 Fresh ground 2⁄3 pound char-grilled burger topped with your choice of cheese, lettuce, tomato and pickles on a grilled artisan bun. 1/3 pound Black Angus beef, char-grilled with bacon, Swiss cheese, sautéed mushrooms, lettuce and tomato. 1/3 pound Black Angus beef, char-grilled your way and topped with a beer-battered onion ring filled with bleu cheese crumbles. Served with fresh lettuce, tomato and pickle. 1/3 pound Black Angus beef, char-grilled with sliced green olives and mayo with lettuce and tomato. 1/3 pound Black Angus beef, char-grilled with hickory smoked bacon, cheddar cheese and our own BBQ sauce. Served with fresh lettuce and tomato. 1⁄2 lb. fresh ground beef and bacon blend, char-grilled and topped with caramelized onions, hickory smoked bacon and melted cheese. Served with lettuce,tomato and pickles. 9 oz fresh ground beef, bacon and jalapeño blend char-grilled and topped with pepper jack cheese, bacon, jalapeños, served with lettuce, tomato, pickle & sweet jalapeño mayo. Burger topped with hickory smoked bacon, American cheese, lettuce, tomato, pickle and a fried egg. *18% gratuity on all parties of 8 or more. Grilled mesquite chicken, romaine lettuce, red onion, cheddar cheese and parmesan Caesar dressing wrapped in a flour tortilla. Served with chips. Chicken tenders, hickory smoked bacon, red onions, cheddar cheese, lettuce, tomato and Caesar/Mayo wrapped in a flour tortilla. Served with chips. Grilled mesquite chicken or steak with sautéed red onion, green peppers, cheddar cheese, lettuce and tomato wrapped in a flour tortilla. Served with chips. Sautéed mushrooms, kale, red onion, lettuce, tomato and provolone cheese with Caesar mayo sauce wrapped in a flour tortilla. Served with chips. Choice of bread: Sourdough, Rye, Wheat or Ciabatta bread. Choice of cheese: Provolone, Swiss, Cheddar, Pepper Jack, Feta, Bleu Cheese, American or Mozzarella. Our tender prime rib, sliced thin and piled high on a grilled ciabatta roll. Served with au jus. Thinly sliced lean corned beef topped with our signature sweet and sauerkraut, domestic swiss and 1000 island dressing on grilled rye bread. Grilled sourdough bread with your choice of melted provolone, swiss or american cheeses. Our tender prime rib, sliced thin, with sautéed onions and green peppers and domestic Swiss on a grilled ciabatta roll. Made “in house” our slow roasted pork is hand pulled and sautéed with fresh green pepper, onion and cheddar cheese on a grilled homemade bread with a side of BBQ sauce. Grilled chicken breast, hickory smoked bacon, country ham, provolone cheese, lettuce, tomato and mayo on a grilled ciabatta roll. Our homemade chicken salad with walnuts and raisins on a croissant roll with lettuce and tomato. Grilled gyro meat or grilled chicken on warm pita bread with feta cheese, tomato, lettuce, red onions and tzatziki sauce. Italian sausage, ham, pepperoni, provolone cheese, red onion, yellow peppers, lettuce, tomato, pickles and italian dressing on our home made breads. 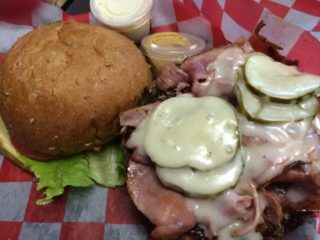 Country ham stacked high with your choice of cheese. Served with lettuce, tomato, pickles and mayo on home made bread. Our pulled pork, country ham, smoked bacon, melted cheddar cheese and Sweet Baby Rays BBQ sauce, with lettuce, tomato, and pickles on our home made bread. Our own 50/50 beef and bacon blend meat balls with marinara sauce and mozzarella cheese on our home made bread. All entrées are served with choice of dinner salad, cottage cheese, soup or coleslaw and your choice of potato, grilled mac & cheese or fresh broccoli. Served after 4 p.m., Sundays after 1 p.m.
Soup and Salad Bar only 3.99 with any entree. Four pieces of marinated chicken lightly dusted in our own unique blend of seasonings, then “broasted” to a golden brown. Absolutely delicious! A 6 oz. marinated chicken breast grilled and smothered with sautéed mushrooms, onions and green peppers with melted provolone cheese on top. A favorite for the young and not so young! Breaded chicken tenders fried to a golden brown and served with French fries and ranch dressing. Fresh from our kitchen. Made “in-house” with our 50/50 beef and bacon burger. Ten ounces of aged and seasoned Western-fed beef, char-grilled to perfection. Our slow-roasted shaved prime rib on grilled sourdough bread, covered with beef gravy with your choice of potato. Two-thirds pound fresh ground burger fried to order and smothered with sautéed mushrooms. Our slow-roasted, shaved prime rib with sautéed mush-rooms and melted cheddar cheese on grilled sourdough bread. Served with French fries. Premium quality, competition style BBQ ribs. Hand trimmed and baked for hours with our sweet & smoky sauce. Tender and Meaty! A generous portion of Alaskan Pollock, hand breaded and fried to a golden brown. Half pound shrimp, breaded and fried to a golden brown. Lightly-dusted and sautéed, served with a pile of bacon and onions. Sorry, no doggie bags with buffets! 10 oz New York Strip Steak and Baked Potato $11.99 with beverage purchase. Served with dinner salad & homemade breadsticks. A generous serving of pasta with meat sauce. Home made with a blend of six delicious cheeses. A favorite! Made with Rico’s original meat sauce, smothered between layers of pasta and loads of cheese. Soup and salad bar only $3.99 with entree. Nacho chips with chicken, pulled pork or seasoned ground-beef, cheddar cheese, lettuce tomato, black olives and onions. Served with salsa and sour cream. We start with a bowl you can eat, fill it with fresh garden lettuce, seasoned beef, chorizo, cheddar cheese, tomatoes, onions, nacho chips, black olives and dressing. refried beans, salsa and sour cream. A large flour tortilla filled with refried beans, a blend of shredded cheddar and Monterey Jack cheese, your choice of seasoned ground beef, grilled chicken, steak or shredded pork, topped with our own burrito sauce, more cheese and served with homemade rice, refried beans, salsa and sour cream. Items: Pepperoni, mushrooms, green peppers, ham, onions, Italian sausage, hot pepper rings, bacon, black olives, green olives, ground beef, chicken, cauliflower, tomato slices, broccoli and pineapple. Chicago Style: Scratch made dough, plenty of sauce, premium toppings & layer of mozzarella, provolone, munster & parmesan cheeses, makes this Chicago style pan pizza a pure Michigan favorite. Baked slow, but worth the wait! Thin style pizza with a buttered crust. 1,000 island, cheddar cheese, hamburger, bacon, mushrooms, red onions, lettuce and tomato. Refried beans, seasoned beef, cheddar-meunster blend cheese plus lettuce, tomatoes, onions, black olives, salsa and sour cream. Homemade corned beef, sweet & sour kraut, swiss cheese and 1,000 island dressing. Cheddar cheese, chicken, bacon, red onion, cilantro and our own special BBQ sauce. Mozzarella, pepperoni, bacon, Italian sausage, ham and ground beef. Northwoods Retro Soda Made in Northern Michigan! Two layers of fresh cheesy melt hash browns stuffed with sour cream and your favorite items and topped with two farm fresh eggs. buttermilk pancake or biscuit and country sausage gravy. Country ham & American cheese. kale, tomatoes. Want something else? Just ask! and served with hash browns. served with hash browns . Click the links above to download and view the PDF menus.